Nike posted this picture on their Facebook page after Oregon won Saturday. Maybe it is a sign of things to come? I hope so because I LOVE this set. Is it just me or do these Nike ads make the featured uniform look 100% better than it actually does in the game? I seem to love every teaser Nike does and then am underwhelmed when I watch the game. Its not just you. Every one of these photoshop fantasies look like crap on the field by comparison, IMO. Its like what happens when you take the Batman costume from the comics (cool, iconic) and slap it on Adam West (ridiculas). Nike, addidas, underarmor, whoever, create these fake images, people go crazy for them, then they dress 70 young people in them... some skinny, some fat, some in great shape, and ask them to run around in the real world. Of course it looks nothing like the designer's perfect untouchable fantasy image. If I ran the world, all these publicity shots would be actual unaltered photographs of actual humans, wearing prototype uniforms. Then, when everone got done laughing, the designers could go back to the drawing board. >Implying that everyone has your taste in uniforms. I hated those uniforms too, but there were a lot of people who loved these, so even if they did just shot the regular uniform, the reaction would've been similar. And this "Photoshop fantasy" thing is not limited to Nike. Every add tries to make the product look better than it actually is, that's what advertising's for! Nope. If you read the first line of my post, I did throw in the "IMO"... which you probably know means "in my opinion". This is a message board, after all. I'm pretty sure I'm not alone in thinking opinions are what message boards are for. I wish Florida St. would wear either the garnet or white pants, especially since ND already has gold pants. I haven't seen either color pants for at least a year, probably longer. They haven't worn anything but gold pants since Fisher became the head coach. He wants to be traditional (ignoring traditions like garnet pants at Florida, or the occasional mono-garnet at homecoming). Oregon is the higher ranked team, so they will be the home team. what they will wear? who knows. i hope not white helmets because of Wisconsin's helmets being white. Also, i'm curious as to what the Badgers will wear. Every Rose Bowl in the recent era where they have worn white they wore red pants with it, but last year they lost in them, so will they change?? just throwing that out there. Wisconsin's unis are known as traditional??? Who knew?!? And hasn't really changed all that much since the 1950s save for the style of W on the helmet. Auburn wearing blue, UVa wearing orange for the Chick-Fil-A (Peach) Bowl. SO, does UVa wear white or blue pants? Baylor players tweeting about new helmet for the bowl. I like it. I would rather it've been sparkley instead of matte, but nevertheless, I like it. Could've been much worse. They've worn a sparkly version of it before. IMO matte will look awful with the shiny pants they've worn this season. Hope this accompanies some new speed machine uniforms (which I doubt since they just got new uniforms this season) or it won't look good at all. I don't like the matte helmet trend (I think most people just do bc it is different), but IMO it only works with teams that use the new matte uniforms. I guess I can stop complaining about the limited colours of matte helmets that we've seen...and I do like what I can see in that grainy, grainy pic. Not too bad, I kinda like it. They should probably wear white pants with them, because I think the shiny gold pants would just look off with a matte helmet. Also, it's still surreal (in a very good way) to me that Baylor now has a Heisman winner. Baylor. baylor's uniforms are an abject disaster this season...49ers retro style helmet...pro combat jersey with visible flywire and cal's modern claw striped pants...no cohesion whatsoever. I really like Baylor's look from the helmet down about to the waist. If they simply put the same helmet stripes on the pants, they'd be ace. IIRC, they had this look before they switched to their current get-up. -Edit, yes they did. And it looked quite good. Just bring back those pants and keep the current jersey and it would be great. 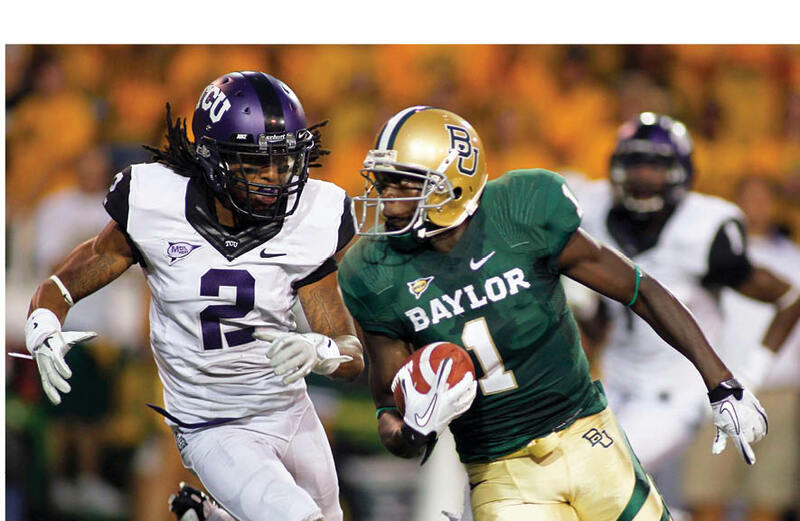 UW / Baylor match up for the Alamo Bowl could look like a scrimmage. Green vs. Purple. 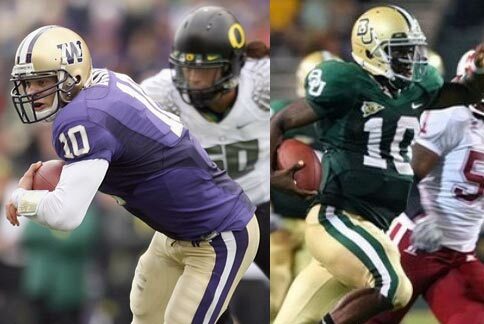 Except that Baylor hasn't worn those beautiful uniforms since 2008ish. I just hope Washington avoids the black Unis. I wish Nike would do a Pro-Combat for UW though. Seems every other school has one. 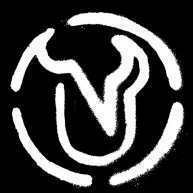 Why not UW?